I am a Latina with curves, and I'm super proud of them. Even at my 'smallest' weight number on the scale, my curves are still there and I love them. I'm very ahem 'blessed' on top, I have a small waist in proportion to the rest of me and great hips, I'm a true 'hourglass', normally that makes shopping for things like jeans and pantsuits difficult for me. A pantsuit for me is usually no fun to shop for, they come together but invariably I end up needing one size for the pants, and a different size for the jacket. Again a small waist and ample bottom also makes shopping for jeans pure torture. So when I find a brand that makes styles with my body type in mind, it's hard for me to refrain myself from shopping there all day long and buying everything up! But let's face it, we have all reached a point where we are no longer buying something just because 'it fits'. That's just not enough anymore. After the roller-coaster year I had last year I am slowly but surely purging my closet of things that merely fit. If I don't LOVE something, it shouldn't be taking up valuable space. My working environments pre-blogging and social media consulting, were all super corporate, so I'd stock up on classic suits and allow the accessories to do the talking in terms of trends and color. But now I'm slowly veering toward adding color to the clothes not just the accessories and experimenting with more dresses. And for me IGIGI has helped me make these transitions much more easily and effortlessly than I ever expected. And I have put the fashions I have tried from them through their paces and everything wears well. I have reviewed some amazing styles from them in the past, the polyvore board I created putting together a great evening style feauturing one of IGIGI's most iconic dresses (the Ambrosia Dress) and their Hanna Coat still gets a ton of traffic (you can check that one out HERE) and I also mentioned the suit I am sharing with you today during my Getting Gorgeous recap coverage from New York City. Now I know I just said I am trying to veer from all black, and I AM, I'm actually doing really well with it, but now that I'm out of a hospital bed and slowly getting back into my routines again I've lost so much weight that my favorite suits were all too big, and some just weren't really worth getting altered at this point. And I strongly want to start over in so many ways. The wonderful folks at IGIGI sent me a Black Suit (in a style called "Monroe") and a gorgeous Tunic Top in the color Scarlet (in a style called "Luella"). 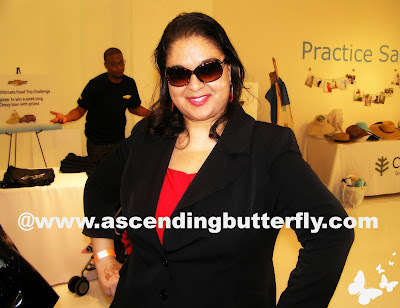 Tracy from Ascending Butterfly (ME!) is wearing the Monroe Pantsuit in Black and Luella Infinity Tunic in Scarlet by IGIGI by Yuliya Raquel, sunglasses are by Foster Grant! This suit is comfortable and seasonless and the bright pop of scarlet from the top really helps pull it together! 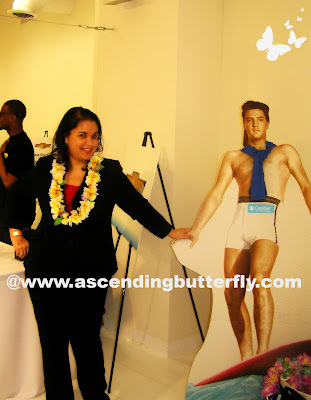 Hamming it up with a Lei around my neck and fun Elvis Standee! I definitely love this suit, and am glad I went bright with the top! Here I am again on the far left, this time my Wilsons Leather Animal Print trench is on top of the Monroe Pant Suit by IGIGI. This suit is super comfortable and super versatile too! IGIGI is the perfect compliment to my curves and my wardrobe! From casual to dressy they offer a wide variety of sizes and styles and their clothes are cut with 'real women's curves' in mind! Want to win a $100 IGIGI shopping spree? Of course you do! 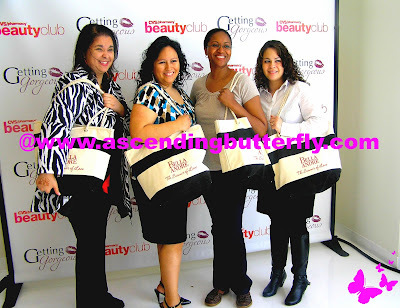 The giveaway is not here, it's on IGIGI's facebook page, (it always pays to Get Social with our Brand Partners! ), all you have to do is fill out a super quick entry with your name, email and age (will NOT be disclosed to anyone!) and then answer the question, Why do I love IGIGI? - Every 100th answer will win a $100 Gift Certificate to IGIGI. So make sure to enter HERE for your chance to win! Love IGIGI! I have tried some of their tops when I was a member of Gwynnie Bee! Must check out their website. @Patty - I haven't tried Gwynnie Bee, I might have to check them out! Good luck in the contest! You look great in your Monroe pantsuit ! I love Igigi they truly have beautiful cloths and no need to settle (so many lovely cloths so little $$$ lol ) . @Big Happy Buddha - Thanks, IGIGI always makes me feel confident and as we all know that's half the battle won!